On the Cover: Outcropping of the Portage Lake Volcanics (1.1 Ma), southeast of Isle Royale, Isle Royale National Park, Michigan. Future Teachers, Carleton College, Northfield MN held on May 10-12, 2007 (Please see http://serc.carleton.edu/teacherprep/workshops/workshop07/index.html). Future teachers are one of the most important constituencies in our geoscience courses. Because they will go on to teach, it is important that we help them learn both geoscience knowledge and effective ways to impart that knowledge to students. Many future middle and high school teachers major in our departments and take both introductory and upper division courses. Future elementary and middle school teachers are an important population in our introductory courses. Increasingly, we teach geoscience courses that are specifically designed to serve future elementary and secondary school teachers. This issue will examine the spectrum of ways in which geoscience courses are being designed to serve the needs of students who are preparing to become teachers: courses that serve only future teachers, those where future teachers are explicitly considered in the design of the course, and those where evaluation suggests that future teachers are well served. Specially designed undergraduate pre-service elementary and secondary courses. New Integrated Science Major with a strong Earth Science sequence. The Master's of Earth Science Education is available to certified teachers who already have the equivalent of a minor in Earth Science. The program has 15 credits of required courses that include doing research for a professional paper and going on field trips. The other 15 credits are electives. The entire program is offered online through the Office of Continuing Education at Eastern Michigan University. SATELLITES program is designed to introduce in-service teachers and K-12 students to basic geographic concepts, geospatial technology (e.g., remote sensing, GIS, GPS, and digital elevation modeling), related data, and applications in complex concepts in Earth System Science. Teachers, who received extensive SATELLITES training in a one-week summer institute in 2006,integrated concepts and technologies in their school curriculum the following fall by engaging students in inquiry-based research projects during an intensive field campaign. 151 K-12 teachers from 110 schools have received SATELLITES training over the last three years and over 10,000 students representing more than 300 schools from every state in the United States and several other countries including Canada, Australia, Great Britain and China have participated in data collection during field campaigns. In 2006, 1200 student observations were recorded and 600 students attended the 2006 annual conference where 60 inquiry-based research project posters were presented. After participation in SATELLITES, teachers' content knowledge in geotechnologies and related sciences increased significantly. Teacher's reported an increase in perceptions of their ability to do inquiry science and employ inquiry-based instruction. They also reported a significant increase in student engagement when students collected data and worked through the scientific process while participating in SATELLITES inquiry projects. MAR-380: The Learning and Teaching of Marine Science, is a science course specifically designed to integrate scientific content and pedagogical practice. This course, developed at Rider University, bridges the gap between the learning of science and the teaching of science through a seamless integration of science content and science pedagogy. The course emphasizes an inquiry-based approach, with students examining four different coastal environments through field exercises on the New Jersey shore. Before each trip, students learn about each environment through lecture and discussion, and develop their own questions about potential interactions between physical and biological processes. Students complete assigned readings of exemplary science lessons pertinent to the field site and answer relevant review questions prior to the trip. Students then collaboratively design field procedures to collect appropriate data to answer their questions. Samples are collected and data recorded in the field, analyzed in the lab, and subsequently integrated into site-specific reports. In the culminating activity for the course, students design age-appropriate learning experiences for K-8 students, based on the new science content they have learned. Pre- and post-survey results indicate a general increase in both students' attitudes toward the importance of science and in their perceived ability to do science. The importance of hands-on activities in learning science all grade levels has been widely recognized for several decades from the results of a number of studies, including: 1. the development of constructivist learning theory (e.g. Piaget, 1967), 2. the introduction of process-based approaches to science education (AAAS) and 3. the development of "discovery lessons" by the Science Improvement Study (SCIS) at UC Berkeley (e.g. Gagne 1966; Cole, 1991). Each approach has supported the merits of hands on learning in the sciences. However, multiple factors act as barriers to the full scale adaptation of hands on activities in classroom science lessons including: limited funds for materials, lack of experiences in teacher training and professional development programs, and limited adoption choices for quality resources such as textbooks and kit based instructional materials (Cole, 1991). Across the disciplines of mathematics and science, widespread attention has been paid to the need for high quality training for pre-service teachers (e.g. Cooney, 1994; Weiss, 1995; Frykholm, 1999), particularly in the implementation of new teaching strategies. For instance, Brown and colleagues (1990) cite the need to shift focus to place greater attention on pre-service teacher training, which we agree is particularly important given reports that some in-service teachers who serve as mentors to young teachers resist implementing reform based pedagogy (e.g. in mathematics, Frykholm, 1999), and given the tendency for pre-service teachers to "revert to teaching styles similar to those their own teachers used" (Brown, et al., 1990). Early teaching experiences for pre-service teachers have been shown to empower students to have confidence to teach, help them clarify their decision to become teachers (or not), and give them improved attitudes towards subsequent coursework (e.g. Cooney, 1994; Weiss, 1995; Frykholm, 1999, LaMaster, 2001). Similarly, early teaching experiences that include service learning has been shown to promote improved attitude in pre-service teachers (e.g. LaMaster et al., 2001) as have programs that use inquiry-based learning environments to train pre-service teachers (e.g. Plevyak et al., 2007), both of which are components of the Hands On Lab (HOL) training for pre-service science teachers. 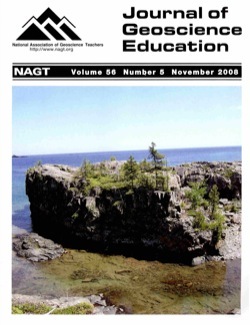 In response to national reform movements calling for future teachers to be prepared to design and deliver science instruction using the principles of inquiry, we created and evaluated a specially designed course for pre-service elementary education undergraduates based upon an inquiry-oriented teaching approach framed by the notions of backwards faded-scaffolding as an overarching theme for instruction. Students completed both structured- and open-inquiry projects and presented the results of their investigations several times throughout the semester. Using a single-group, multiple-measures, quasi-experimental design, students demonstrated enhanced content knowledge of astronomy and inquiry as well as attitudes and self-efficacy toward teaching. A state mandated change in the requirements for the preparation of future K-8 science teachers was viewed as an opportunity to build a new Integrated Science program at a modest-sized state university in the Midwest. The Earth/space component is a four course sequence for thirteen credits guided by a conceptual framework that promotes the development of content and conceptual Earth systems knowledge, geoscience pedagogical knowledge, and understanding the critical role human beings play in the natural environment. Field-based Earth science education experiences are central to each course. Several formative and summative assessment approaches indicate that the Earth science courses have been effective. Measures of success include a greater than ninety percent pass rate on the state certification exam and students that are active in organizations, presenting at appropriate meetings and/or publishing in peer-reviewed journals. This study measures the effect that field-based instruction has on student learning of earth science content knowledge related to sedimentary rocks for college students intending to be pre-service elementary teachers. A total of 36 students from 2 semesters of a specialized earth science course for pre-service teachers participated in a mixed-methods study. The students received the same 3 day inquiry-based classroom curriculum and field trip preparation, but 3 variations of the field trip were administered. The first field trip was a guided-inquiry, hands-on exploration where students were actively involved in directing their learning, the second field trip was a lecture-based field trip where the instructor directed the student learning, the third was an immersive, inquiry-based virtual field trip presented in Quicktime VR. The quantitative findings indicate that all field trips produced gains in understanding beyond those produced by the classroom curriculum, and that this increase in learning came about regardless of the type of field trip the students experienced. Interviews and other qualitative analysis reveal that students who participated in the guided-inquiry, physical field trip did emerge with a deeper understanding of the conceptual ideas compared with other field trip styles. I have developed a hands-on guided-discovery course for future teachers that includes a semester-long research project about the moon. This project, which is designed to give students the experience of conducting a long-term scientific investigation, requires students to make daily naked-eye observations of the moon and construct graphs of given data (such as moonrise/set times and dates of moon phases) in order to discover and demonstrate a variety of phenomena related to the moon. Once students have discovered, discussed, and visualized their way to an understanding of various concepts relating to the moon, they develop and teach a hands-on guided-discovery lesson on those concepts to their classmates. Finally, they write a teacher's guide that explains the concepts and could show other teachers how to replicate the lesson. Assessment of students' understanding of the moon and their self-reported evaluations of the moon project experience demonstrate that, although it is challenging and at times frustrating, it is a unique and valuable educational experience for the students. course for secondary education earth science majors and the weather and climate course for elementary education science majors demonstrate one way these courses with similar content are handled. Courses are designed to take advantage of the inquiry-based or active-learning techniques to teach course content while serving as a model for teaching methods. Therefore, major parts of the content are taught within the context of pedagogy that serves well both education majors and science majors. In courses that include only education majors the pedagogy is further discussed and the students are given an opportunity to practice satisfying state content expectations by presenting lesson plans they develop. science teachers, unlike biology teachers, has never reached full capacity, which has likely contributed to the lesser presence and status of Earth and space science in U.S. high schools today. Historically, the geoscience community has focused on enriching teachers' geoscience content knowledge, but modern Earth and space science teachers need more than just content knowledge. This research examines the design and impact of an Earth in Action pre-service teacher course created at Kansas State University (KSU). The course connects content with pedagogical modeling for the K-12 classroom. Instruction is supplemented with projects, in-class activities, clicker assessments, and video case studies. The goal is to deliver content and best practice instruction together in a model that pre-service teachers can use when teaching earth science in their K-12 classrooms. Data was collected from 104 pre-service teachers enrolled in the Earth in Action course over three semesters. University course evaluations, open-ended pre-service teacher questionnaires, and the Middle School Science and Earth and Space PRAXIS II tests were used to collect data. University course evaluations showed high to very high (4-4.3/5) mean ratings for all of the instructional evaluation categories with pre-service teachers reporting the highest mean for the "overall effectiveness of the course." Open-ended questionnaires revealed an overwhelmingly positive response for the connection between content instruction and pedagogical preparation. Questionnaires also revealed positive feedback with the overall design of the course with comments indicating the combination of activities helped pre-service teachers maintain focus throughout the course. KSU pre-service teacher scores on the Earth and Space portion of the Middle School Science PRAXIS II exam were 1% higher than the national average. Scores from the Earth and Space PRAXIS II exam were higher than the national average in 67% of the test categories with the difference ranging from 1-12%. The astronomy portion of the Earth and Space Exam showed the largest performance gap with KSU pre-service teachers scoring below the national average by 12% and the Earth's Atmosphere and Hydrosphere section showed a 2% gap with the national average. The 12% performance gap in astronomy can be correlated to the lack of astronomy content covered in the pre-service Earth in Action course. The Earth's Atmosphere and Hydrosphere content is included in the course, so improving the instruction and the amount of content in this area may help to minimize this 2% gap.